FIREWORKS #75 – BIGGER, BETTER, HARDER ROCKING! The new, improved Fireworks #74 went down VERY well, and new 132 page issue #75 is even BETTER. 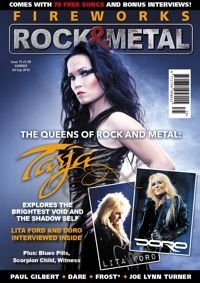 This issue is packed with awesome female rockers, with ex-Nightwish vocalist Tarja discussing not one, but two upcoming new releases. We also hear from legends Doro Pesch and Lita Ford, along with the likes of Erika, Blues Pills, Lacuna Coil and Scorpion Child. For a trip down memory lane, Dave Reynolds gives us a three and a half page feature on the wonderful Witness, with all new interviews with Debbie Davis and Joey Huffman. Dave also supplies this issue's 'Take 5', looking back on releases which he feels should have been way more successful than they were. Elsewhere we have the first print interview with Darren Wharton on the new Dare album, which sees Vinny Burns return to his rightful place at Darren's side, supplying the tasteful guitaring that only The Viper can! And also interviews with Joe Lynn Turner, Ace Frehly and a detailed chat with Punky Meadows as he discusses his debut solo album as well as the Angel days. Plus Jorn, Dan Reed Network, Vega, Chris Ousey, Q5, Kissin' Dynamite, The 69 Eyes, Frost*, Ted Poley, Phantom V, The Jelly Jam, Iron Saviour, Haken, Paul Gilbert, Royal Republic and oh, so much more. Amongst the features are The Expert's Guide: Mark/Marcie Free and a four-page 'Unsung Hero' in-depth look at the career of Robin George. Interviews, reviews and 78 FREE songs: LET'S ROCK! Add this to the most extensive and detailed reviews around PLUS a free CD featuring 78 songs, and you REALLY have way more hard-rocking melodic metal than you could shake a reasonably sized stick at.